Local search optimization is the optimization of your local search and directory listings. This is done with hopes of ranking in the top 3 local search results AKA the “3 pack” in Googles Search results. Local search is getting more and more popular because it is actually displayed ABOVE the standard organic search results. The local search results appear after Google has determined your geographic location while searching. Because of this, ranking in local search results is really only beneficial to businesses that serve their clients locally. How is Local Search Optimization Done? 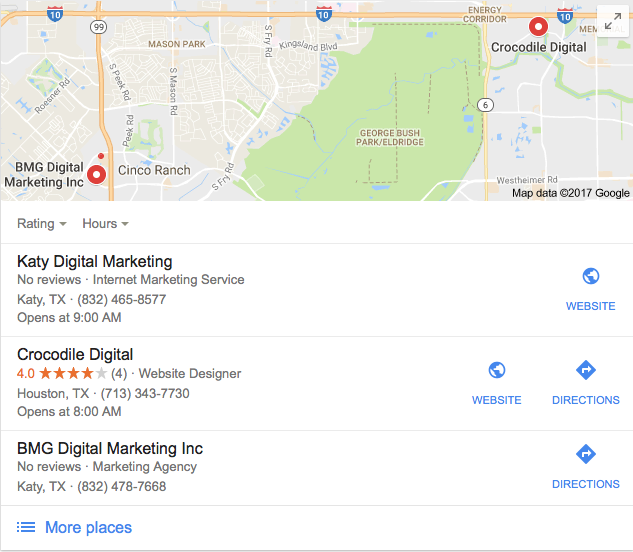 Katy Digital Marketing helps you rank higher in local search results by first creating consistency among ALL your directory listings on the internet (Google Maps, Yelp, Yellow Pages, etc.). If these don’t match up, it can create problems in Google’s ranking algorithm. We will also optimize your Google Maps listing by adding content and meta tagging that content with your specific keywords. Finally, we will walk you through the process of getting a Google Virtual Tour added to your listing which has an added boost to your rankings. *Local Search Optimization is ONLY offered as a part of our Comprehensive SEO package and not as an individual service.